In the entire state of Kansas there are less than 50 wineries, but that number is probably no surprise. 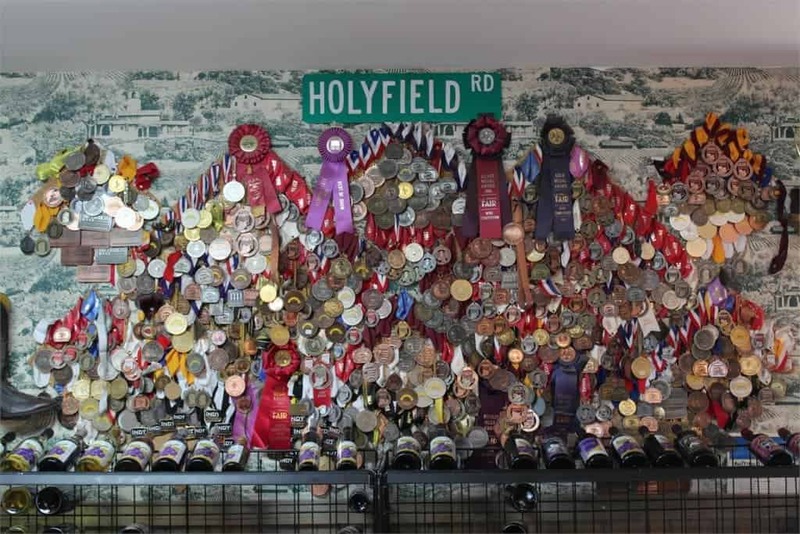 What may surprise you is that located in Basehor is Holyfield Winery, which sits upon 14 acres of fertile Kansas soil. If you leave Kansas City, Kansas traveling west on Highway 40 (State Avenue), the next town you come to will be Basehor, Kansas. With just under 5,000 residents, this city is comprised mostly of residential housing, with a smattering of small restaurants and businesses. Most of these are in place to support the local population, but Holyfield stands out as unique in this sleepy little town. 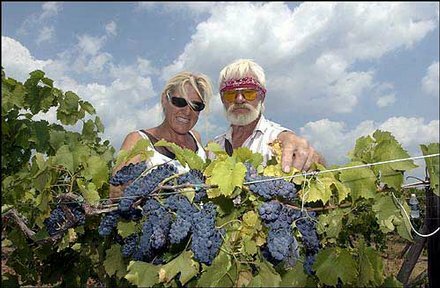 On this site, Les and Michelle Meyer oversee the production of fifteen distinct wines. This father and daughter duo have created wines which have won a slew of domestic and international awards. The winery has been featured in numerous newspaper and magazine articles. Their wine-making pedigree is well founded, but the true accolades come from the guests who return regularly to purchase the vast variety of products offered in their storefront. Here you will obviously find their wines, but you can also peruse a wide selection of wine accessories. Everything from glasses, stoppers, and aerators fill the display areas, but you will also find snacks created to accompany the various vintages. Around Valentine’s Day each year they will offer a limited amount of their wine filled chocolates, but you have to be quick to get these. 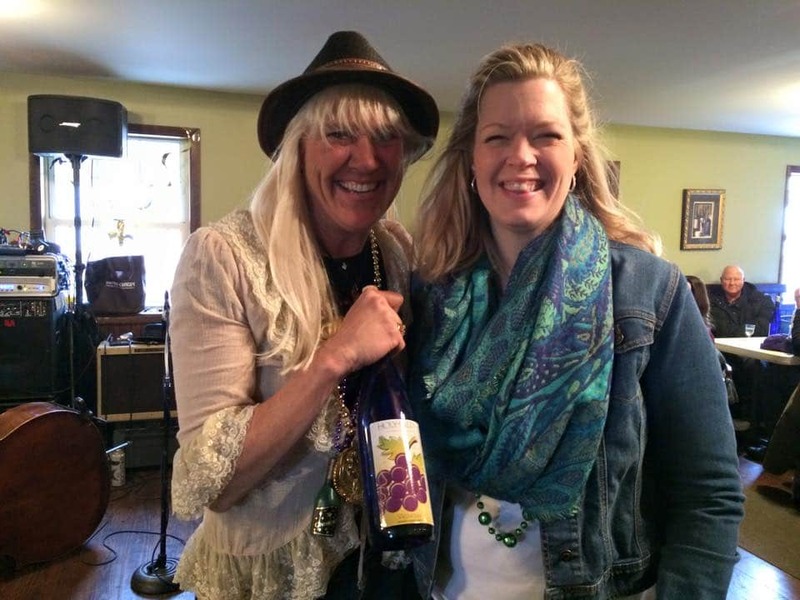 Holyfield Winery has a regular schedule of events, with many featured around specific occasions. At these events they will open up the banquet hall, and they will usually involve some form of musical entertainment. Local and regional bands will supply the tunes, while guests savor the wine varieties. Sometimes food trucks will be on-site hawking their goods to guests. Of course, many veterans of these events will bring a picnic full of snacks. The tables fill quickly, and people mingle with table-mates creating new friendships. During these events, Michelle, along with tasting room manager Mandy Hampton, bounce around the room engaging with guests. The mood is always jovial, and the music helps cement a lasting positive memory. Michelle & Mandy take a moment to pose. The winery also plays host to a few murder mystery dinners throughout the year. During the summer they hold a regular music series on Friday evenings. During these concerts guests can bring their lawn chairs and stretch out among the vines. It is a perfect opportunity to watch a Kansas sunset, while enjoying one of their delicious wines. As you can tell, there are many opportunities throughout the year to enjoy a relaxed, laid-back event at Holyfield Winery. Drop in at one and sample the wines in their tasting room. We are sure you will find one that you like the best, and just maybe you will run into us there. It’s a great way to make new friends, while supporting a local business. Cheers! What’s up,I log on to your new stuff named “Holyfield Winery – Our Changing Lives” regularly.Your writing style is awesome, keep doing what you’re doing! And you can look our website about تحميل اغانى. Thanks. We will certainly keep going. Thanks. After a long haul on our old blog, we were a little hesitant to launch a new one. After less than a month, we are glad we did. The acceptance and increase in traffic has been overwhelming. We hope to create a site that Baby Boomers, and all ages, alike can use for real travel advice. Hope you enjoy more of our articles.